Original spare tire has never been used! 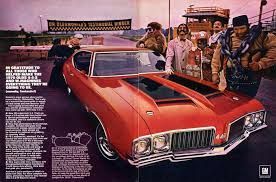 Oldsmobile's mid-size muscle machine, listed as a separate series beginning in 1966, has a 112-inch wheelbase and a screaming 400 V8 motor with 325hp/360lb-ft paired to a 4 speed Muncie. This Oldsmobile is very original and a great representation of the 1969 model year. Sporting an excellent red paint finish with nice chrome and trim this coupe will get attention everywhere you take it. The body has a lot of original sheet metal, is very straight and the chrome is in great condition. Under the hood is the numbers matching original 400 cubic inch V8 the car was born with from the factory. Featuring many original parts under the hood and the "keep your car all GM" sticker adds nostalgia. The interior is nicely restored with many original parts and new upholstery all around. The black bucket seats are very comfortable and hold you nicely when you drop the clutch and release the torque of this 400 V8 supplied by a Quadrajet. The large secondary openings on the Quadrajet carburetor give you a unique driving feel that only GM cars have! The undercarriage is nicely detailed and restored to original specifications which means it drives like brand new car. This Oldsmobile is very original and unmodified. The value will continue to go up as you drive and enjoy this piece of history!